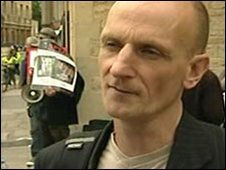 An animal rights campaigner jailed for 10 years for a fire-bombing campaign against Oxford University has had his conviction overturned. Mel Broughton, 48, of Semilong Road in Northampton, had been found guilty of conspiracy to commit arson. Mr Broughton had argued that he was no more than a peaceful protester. The Court of Appeal said an error in the trial judge's summing up meant the conviction was "unsafe" and it ordered a retrial. Broughton had argued he was found guilty on the basis of unreliable DNA evidence. Lord Justice Thomas, who heard the appeal with Mr Justice Kitchin and Sir Geoffrey Grigson, said: "Although the judge was correct in admitting the DNA evidence before the jury, we quash the conviction on the basis of a misdirection." He also ordered that nothing else about the judgment be reported. After an application by crown prosecutors, the judge ordered that Mr Broughton, who was not present in court, be retried.